Some fungal transcription factors contain an N-terminal domain, the copper fist, which seems to be involved in copper-dependent DNA-binding [(PUBMED:8262047), (PUBMED:8509391)]. These proteins activate the transcription of the metallothionein gene in response to copper. Metallothionein maintains copper levels in yeast [(PUBMED:3052856), (PUBMED:8262047)]. The copper fist domain, which is similar in structure to metallothionein itself, undergoes a large conformational change on copper-binding that allows DNA-binding. 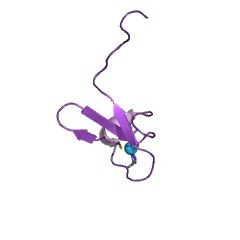 The domain contains a conserved array of zinc-binding residues (Cys-X2-Cys-X8-Cys-X-His) and forms a three-stranded antiparallel beta-sheet with two short helical segments that project from one end of the beta-sheet [(PUBMED:9665167)]. Conserved residues form a basic patch that may be important for DNA binding. There are 310 Cu_FIST domains in 310 proteins in SMART's nrdb database. Taxonomic distribution of proteins containing Cu_FIST domain. This tree includes only several representative species. The complete taxonomic breakdown of all proteins with Cu_FIST domain is also avaliable. Click on the protein counts, or double click on taxonomic names to display all proteins containing Cu_FIST domain in the selected taxonomic class. Regulation of metallothionein genes by the ACE1 and AMT1 transcription factors. The AMT1 metalloregulatory trans-acting factor from Candida glabrata was found to functionally mimic the ACE1 metalloregulatory trans-acting factor from Saccharomyces cerevisiae in the copper-induced expression of the chromosomal S. cerevisiae metallothionein gene. Plasmid constructs with promoters of various metal-inducible genes fused to the bacterial beta-galactosidase (lacZ) reporter gene were used in S. cerevisiae to evaluate the roles of ACE1 and AMT1 in mediating metal-stimulated expression. Promoters from the S. cerevisiae CUP1 gene and Cu,Zn-superoxide dismutase (SOD1) and from the C. glabrata MT genes MTI, MTIIa, and MTIIb were used. The ACE1 factor was effective in the metalloregulation of the two S. cerevisiae promoters, CUP1 and SOD1, but of only one C. glabrata promoter, MTI. AMT1 was found to be effective in the metalloregulation of all three C. glabrata MT promoters and the two S. cerevisiae promoters tested. The regulation mediated by both ACE1 and AMT1 was copper-dependent and copper-specific. Episomally expressed SWI5, a distinct trans-acting factor of S. cerevisiae, enhanced only the basal expression from promoters. The SWI5 enhancement was not metal dependent. In conclusion, AMT1 and ACE1 are functionally homologous in metal-specific regulation, AMT1 appears to be more promiscuous than ACE1 in this function. Copper activates metallothionein gene transcription by altering the conformation of a specific DNA binding protein. Copper homeostasis in yeast involves a copper binding protein, metallothionein, and a trans-acting regulatory protein that activates transcription of the metallothionein gene in response to copper ions. We show that the regulatory protein specifically binds to the metallothionein gene control sequences in the presence, but not in the absence, of copper. Both the DNA binding and metalloregulatory functions of the transacting factor are contained within its aminoterminal domain, and partial proteolysis experiments show that copper activates this domain by causing a major switch in its conformation. Silver also activates the DNA binding domain in vitro and induces metallothionein gene transcription in vivo. We propose a novel copper cluster model for the DNA binding domain based on its surprising structural similarities to metallothionein itself.